Soeur Josephine, a member since about a year now told me a few days ago that she had a piece of property she wanted to give to the Church. President Desire and I determined that we would go with her last Saturday to look at it. We went north of Calavie about a 45 minute drive to a village out in the jungle. The property is about an acre or so of raw jungle land. It is located in the village where Soeur Josephine grew up. I have written to the Area Presidency to see if they want to accept it. Whether they do or not, it was a most interesting trip. The jungle is interspersed by bicycle paths (some of which are wide enough you can get a vehicle down if you are careful) and pineapple fields. Not fields really so much as little patches that are worked by hand. There was quite a group of us since 3 of Josephine’s children and one nephew also went with us but I was the only Yovo. After we finished looking at the land, we went to the little African hut where Josephine grew up and where her mother and the children’s grandmother still lives. She is probably the oldest person we have seen here. Maybe even as old as us, except she is not out doing missionary work. After the visit, she was insisting that she show us to the gate which is always African courtesy, but President Desire managed to convince her that we could make it on our own. She only speaks the native language so I could not communicate much. We also met Soeur Josephine’s sister, aunts and uncles and cousins to numerous to mention even excluding all the children. It was almost as bad as being in Blanding and trying to meet the Black family. It was just a delightful experience. When we left the village and headed back I assumed we were finished and going home. Before we had gone very far on the highway, Soeur Josephine told me to slow down and pull of the road in front of a large nice home. She said that this was where her husband lived but she was not welcome there. Nevertheless, everyone piled out and went inside. The yard was more beautiful than the house. There was green grass bordered by immaculately trimmed hedges, paths and small tropical and bonsai trees. We went around back and were welcomed into a beautiful and spotlessly clean house by her husband’s brother and two women, whom I assume were his wives, all of whom greeted Josephine like a long lost sister in law. On the wall were paintings of her husband. I don’t remember the title, but if we were at home it would probably be something like President of the Senate or Speaker of the House of Benin from about 2001 to 2007. I guess they separated about 16 years ago but were never able to get a divorce. Beyond that, I try not to ask too many questions. I have about given up on understanding African culture and now just go with the flow. You will understand that better as you read further. Later that evening, we were at the chapel when a man stopped by with an invitation for us to attend a school graduation – another cultural first. I will let Soeur Black write about that. 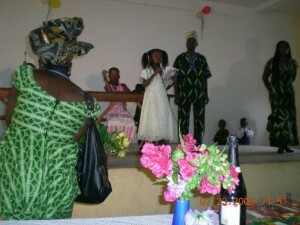 First of all we need to address the invitation which was from the Unique Academic International School of Cotonou inviting us to “Graduation and Prize Giving Day.” It was to be held on Wednesday, July 23 at 11:00 Prompt. 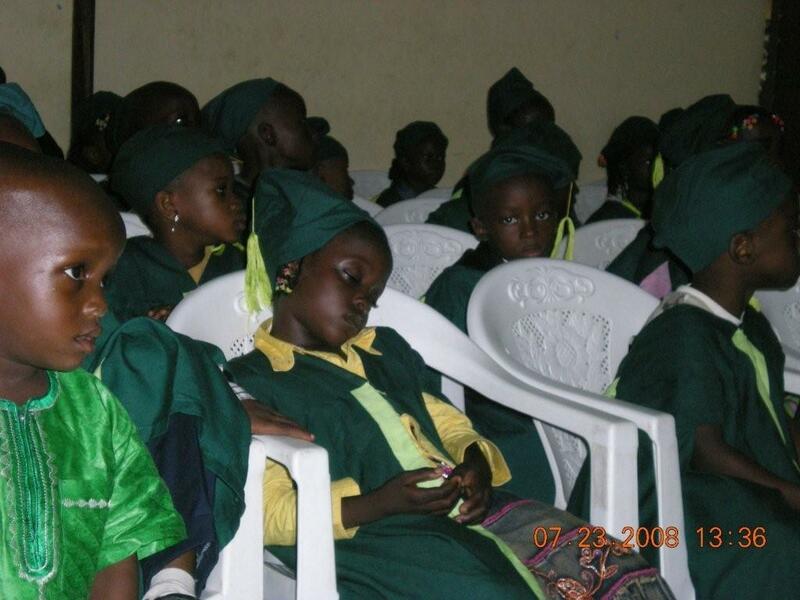 Not ever having been to such a graduation we had a suspicion about the terminology of it being a “Giving Day” as it is a private English school run by and for primarily Nigerians. But the 11:00 am prompt threw us as we did expect it to be a little late but maybe just a little. We had three of the students from the branch with us and were immediately ushered into a large auditorium about the size of the elementary school auditorium complete with a stage and decorations. Just before we arrived the proprietor chased us down on his moto and asked Elder Black if he was going to do his magic tricks as Elder Southam did last year. Blindsided once again. We were the only ones in the auditorium even after 11:00 prompt so he decided to go back to the apartment and get Elder Phillip’s harmonica as it looked like he was going to be on the program. While he was gone, our three student friends abandoned me as it was a lot more exciting in the courtyard with their friends. (Sounds like home, doesn’t it?) As I sat as a primary observer, a man began to set up some real serious music equipment. That means a CD player with huge speakers and I knew what was coming – LOUD music. The sound of the music drew the kids in out of the courtyard and soon the stage was full of kids of all ages dancing to the beat. Africans seem to be born with a built-in sense of rhythm so the sitting got more entertaining, and I can still hear out of both ears so that part was a success. Here, louder is better! Elder Black missed the dancing as he was on the harmonica run. The actual program began about 1:00 pm and was in English (I think). 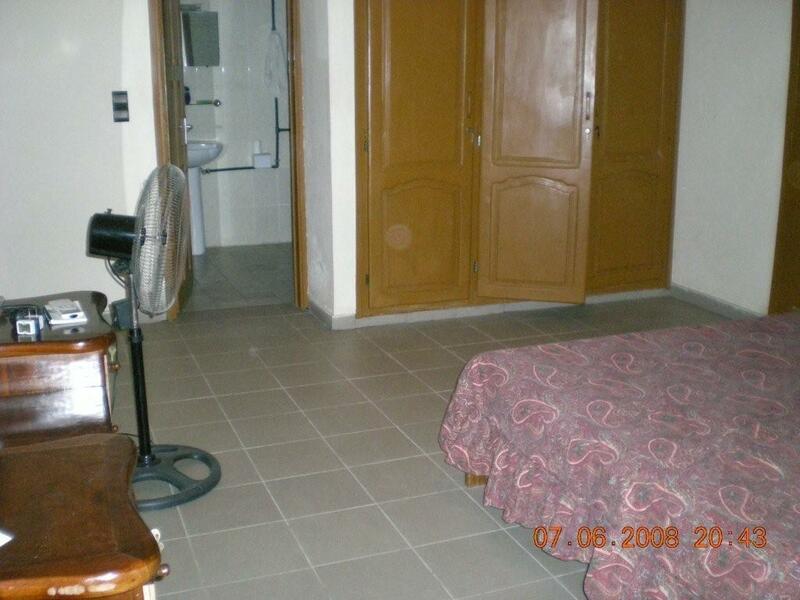 Between the Nigerian accent and the quality of the loud speakers it was really hard to tell. The chairman wasn’t there so one of the teachers got up and filibustered for another hour and by this time we found ourselves sitting at the “high table,” the dignitary section, wondering what in the world was going on. Every time some students were presented for graduation or performing, their parents or friends came up and threw money at them or pressed it on their foreheads. There were what looked like 20 dollar bills being thrown everywhere. (We found out later they were Nigerian currency valued at less than 20 cents.) so when our friend Nancy was presented for graduation, her mother was not there so we gave 2000 cfas which is worth about 4 dollars. She was happy and could leave the stage which leads up to the next part of the giving process. The kids are not allowed to leave the stage until someone comes up and gives the kid money for the school. When some of the little kids performed on at least two occasions, 4 little kids were left standing looking so sad. We felt so bad for them so we bailed them out for 1000 cfas each. We had another appointment at 3:00 (it was originally for 1:00 but we called and changed it when we could see what was happening at the school.) so we excused ourselves and left. We found out later it was just before the big donation time and they were expecting us to be big time givers and thought we left because we did not want to give. We had already given the equivalent of about 40 dollars and thought we had done pretty well. We suspect that the Southams were a little more generous last year and perhaps we disappointed them. We also found out later that after the big donation time there was more program and eating and the entire graduation lasted until 7:00 that evening. Next year we will be a little wiser! A post script to the graduation, no harmonica from Elder Black this year as it was going to happen after the big donation time. Saturday was another big day in our lives in Cotonou. Mma and David were both baptized and both are Nigerians. We have helped teach both of them, and they are really fine individuals and will be great assets to the church. They are some of the first people we met here after arriving. Mma wanted to be baptized sooner but because of certain conditions she had to have a personal interview with President Ayekoue. I decided that Nigerians like to celebrate as afterwards David served sandwiches and drinks, and Mma served chicken and hot rice. When Mary, also a Nigerian, was baptized everyone got a drink and some little cakes. Maa and David both have such strong testimonies now so hope they will both continue in their spiritual progression. It seems as if fellowshipping by the members at this stage of their lives is absolutely essential and it appears to be happening as both have a lot of friends in the branch. 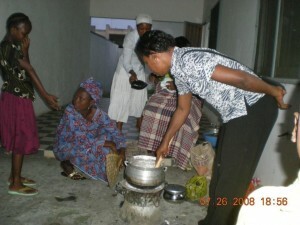 After the baptism, the Relief Society had a social planned with a cooking lesson on Ebo food by Mma and Victoria Dike. I couldn’t help but remember the goat intestine stew, so I was a little apprehensive about the tasting afterwards. My fears were in order as I soon learned that the main item of the day was cow intestine stew served with cassava pate. 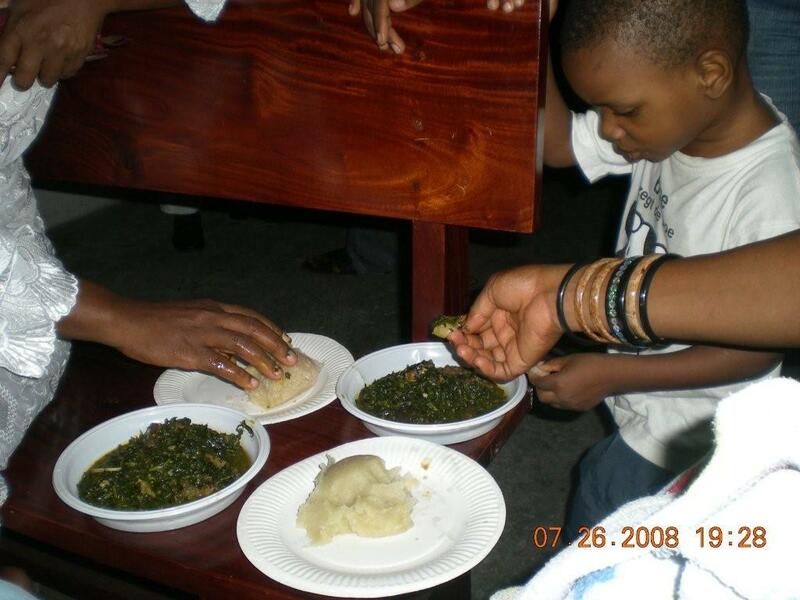 I learned exactly how to prepare this most cherished dish of the Nigerian Ebos but do not think the grandkids would be very impressed. I will give you a step-by-step description of the process. It is cooked on a small charcoal burner on the ground so the charcoal must be started and fanned. Pour water in a big aluminum pan and bring it to a boil. Take the bones out of dried fish and throw the meat in the pot along with a huge dried fish head. After it has cooked for a while, add a plate full of cow intestine, onions and liver and cook for about one hour. Cut a huge pan of greens in small pieces and add to the above cooked fish and stir real well. Add some dry shrimp powder and dry piment (hot pepper). Cook until it is not bright green any longer. Serve with pate made from cassava meal which is poured in boiling water and stirred until it will form big thick blobs. This is eaten with your fingers by pinching a piece of the pate and dipping it in the green mixture. I was instructed not to chew but old habits are hard to break so chew I did. It took four Tums last night before sleep came my way! Elder Black adds: But she was a good sport and the social was a success. As a post script to the lead paragraph this week, Soeur Josephine had a younger brother who has been in the hospital for several weeks. We have been to visit him a couple of times. The last time he was completely non-responsive and it appeared his time here was growing short. We got word on Thursday that he had passed away so went over to Soeur Josephine’s. His wife and their son was there. We gave them a message of comfort as best we could. They came to church today with Soeur Josephine. We also had a baby run this week. Frere Pierre, who is kind of the fix-it man for the chapel, our apartments and everything else, and his wife got a little baby girl born C-section on Thursday. Since they only have a moto, we offered to provide transportation to and from the hospital, and the help was gratefully accepted. We were a little surprised and pleased since they seem to be very private people. We will give more details and some pictures next week. July 24th came and went unnoticed as did the 4th of July. We probably should have at least had a program at the chapel and talked about pioneers. Maybe next year. Before we came to Benin, we ran across some information that the legendary Amazon Women Warriors actually originated, not in Brazil as I had thought, but in Dahomy which was the predecessor country of Togo and Benin. They were apparently a fierce female fighting group feared by all. This week, in trying to get Elder Kabangu sent back home to the Congo after finishing a good mission, we found out that their descendants are still very active. Let me explain. Being unlearned in African air travel I naturally assumed we could buy a ticket at the airport and get him on his way so last week we attempted to do so in order to be ready. All we came up with was the phone number of Benin Golf Air, of which we were assured made the only non-stop flight between Cotonou and Kinshasa in the Congo. After a number of other inquiries and a trip across town, we found their offices and sure enough were able to purchase the ticket for Wednesday. We were instructed to be at the airport at 7.00 A.M. for his flight at 10.00 A.M. We were there and all was calm and peaceful. So far so good. The security guard told us to get in a line for the Congo, and another one was made for those going to Nigeria. After waiting for an hour or so all of the Nigerian passengers were very orderly called and proceeded to go into the room where they could check their luggage. Still, so far so good. About a half hour before the flight was to leave for the Congo word got out that it was not even going to fly. The good so far deteriorated very fast and all pandemonium broke loose. Paying bills is another story that nowhere resembles what we are accustomed to. For example, the electricity bills are paid in cash each month, so you need a bag full of bills for that transaction. We pay the bills for the missionary apartments and the church. They were due last week, so we tried to pay them at least three times but the electricity was cut so the doors were locked and the bills could not be paid. We finally got the bills paid yesterday morning but with communication the way it is I guess we were already scheduled for cutoff and so the meter was locked a while after the bill was paid. Today the power was off most of the day anyway so I guess it doesn’t make a great deal of difference, but I decided we better get it turned back on. I won’t bore you with all the details, but to summarize, I waited in line for a couple of hours and after a day of uncertainty and a payment of about 7 bucks penalty, the power was finally restored this evening. Maybe I had better make a greater effort to get the bills paid faster. While I was out paying bills, the neighbor kids came over very animated and excited – all talking French as fast as they could and were sure that Soeur Black should understand. 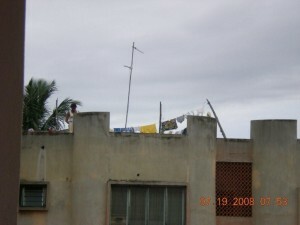 With the help of a lady waving from the roof of the Elders apartment across the street, she finally did understand that the lady (their mother) was locked on the roof and had forgotten her key. I guess she was out on the roof hanging out clothes or something and the elders left and locked the downstairs door. (This probably doesn’t make any sense unless you realize that the door to the stairwell is kind of a common door and there are several apartments in the building, one of which is occupied by 4 of the elders.) I was quite proud of Soeur Black, she talked enough French to tell her to wait and she would call the elders to come back and let her out. They arrived a while later and the crisis was past. We went out awhile ago, and the lady came across to tell us that the prisoner wanted to say thank you. We all had a good laugh. We have had some amazing teaching times this week. 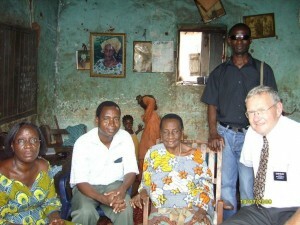 We went with the Elders to Akpakpa to teach Mma about tithing and fast offerings. Elder Phillips asked if she knew what tithing was and her answer was “of course, you can read about it in Malachi.” When he asked if she was willing to commit to pay tithing, her answer was “of course, I already have.” The same answers were given for fast offerings. Then the most amazing thing happened. Here is a girl who doesn’t even have electricity for her little restaurant but she pulls out this little book in which she had listed every item she had sold since she opened the little place and explained that she needed to go through and make sure that she had paid her tithing on each item. I told her as one accountant to another, be sure to subtract your overhead as you don’t have to pay tithing on any costs. I am still amazed by the incident. The next stop was at David’s house. David is another English speaker–a tall good looking guy. Before we finished, he was teaching us out of his scriptures. Both of these are scheduled for baptism on Saturday, July 27th. 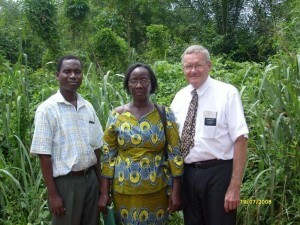 Another first this week was the return of Benin’s first missionary. 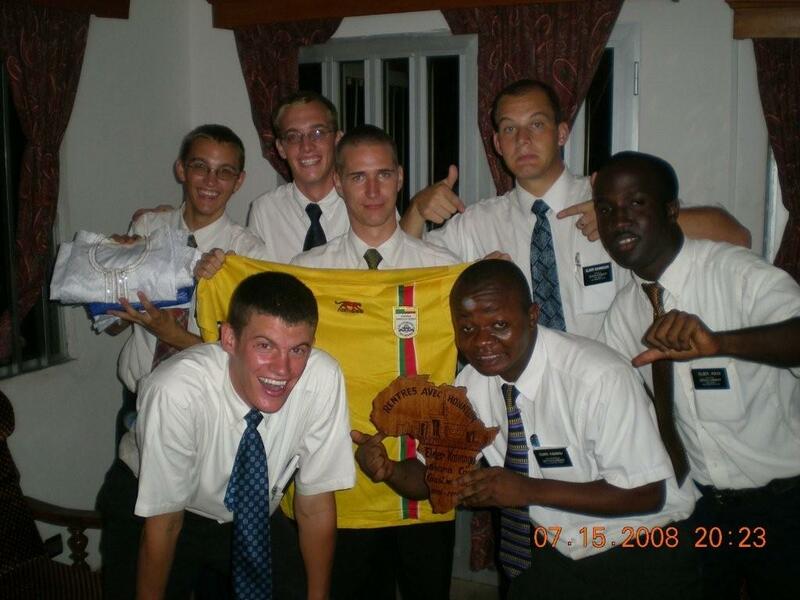 Elder Geoffry (I guess I don’t know his last name) got back on Tuesday night. He is a bit of a lost soul and has been over a couple of time already to tell us about his mission and deliver letters and show us pictures. He is going to be a real asset to our rapidly growing branch. A day after our teaching experience in Akpakpa, we went out to Calavie to see Julianne, Carole’s mom who is the deaf lip reader. We asked her what we talked about last time and she basically reviewed the whole plan of salvation without stopping. It was quite humbling to realize that someone so handicapped on the outside has that kind of a spirit inside. We are really enjoying the experience of going out and teaching her with Soeur Nadia, our Fon translator. Nadia is a young girl who is 24 years old and speaks no English so we use the driving time for Soeur Black to try out her infantile (her description, not mine) French. Nadia is also a very good cook and is teaching me how to prepare some Beninese cuisine. In fact she came over here on Monday and we prepared a dish called atashi which is rice and beans cooked together with a tomato, piment and shrimp sauce on top. It does not taste fishy at all as the shrimp is a dried powder and there is not much in the sauce. It was really delicious. Back to the ride to Calavie. On our way I asked Nadia where I could buy some dried corn and have the neighborhood man with a grinder make some corn meal. She said wait until we get to Calavie as it is cheaper there so as we were bumping along on a back road to Julianne’s, she told us to stop and buy some from a woman who was selling some by her house. After the discussion at Julianne’s, it was time for a lesson in how to clean the corn before taking it to the grinder. First, you put the corn on a square woven screen type of contraption. We picked out the bad kernels and the Nadia flipped it up in the air so the chafe would blow away. It was really and efficient way to get the job done and I was impressed. With the job all done the corn came back to Cotonou where the elders know a man who will grind things and it was turned into corn flour, as opposed to corn meal. The resulting corn bread was well received by the elders and I even got a little taste that Soeur Black had rescued for me when I got home from another adventure which we will describe next week. A big African Bonjour from Cotonou. I think we have set a precedence for ourselves with the expectations we seem to have from posting our blog each week. This is the second week now that Elder Black has not had a free minute to write so will make another feeble attempt to inform everyone of our life here this past week. First of all, we have had electricity every day for one week. Hurray! Each day I remember to give thanks for things that are certainly taken for granted at home. 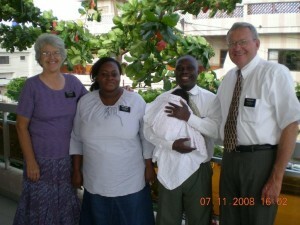 I would like to give you an example of humble gratitude of one of our investigators who will soon be baptized. We have mention MMa before when we described to you her goat intestine soup. She is from Nigeria and is trying desperately to make a living for herself and nephew plus send some money to her mother in Nigeria. She has had restaurant experience and decided to open a small little cafe by the road on one of the residential streets in Akpakpa, an area of Cotonou. 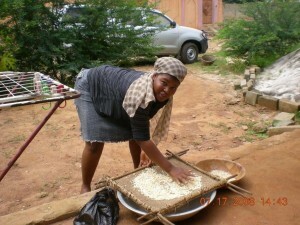 She did not have enough money for electricity so she cooks on the little charcoal burners that are so prevalent here. Since coming to our church, the pastor from her previous congregation told people not to patronize her establishment; therefore, she has very little business. When we were there last week in her prayer she was thankful for the air we breathe, the sunshine, the rain, our health, that we have food to eat, a place to sleep, etc. For her, a place to sleep was the floor of her restaurant, food was not three squares a day, and health was not having enough money for malaria medicine when she contracted the disease, but she was thankful. It is almost embarrassing to think of what we have at home and how little we think of how much we waste every day. I have gotten to the point where, even when we say at home that we are thankful for our blessings, I really wonder if we even know what we are saying. I guess that is not for us to judge. I am certain that we have talked about this before but being in Africa has certainly changed our concept of wants vs needs and gratitude for what we have. Not that we were not grateful before, I guess we just never realized that so many people have so little and are perhaps more grateful for what little they have than we seem to be for the abundance we enjoy. Soeur Black is busy helping Godwin with the dishes so I will take over for a bit. 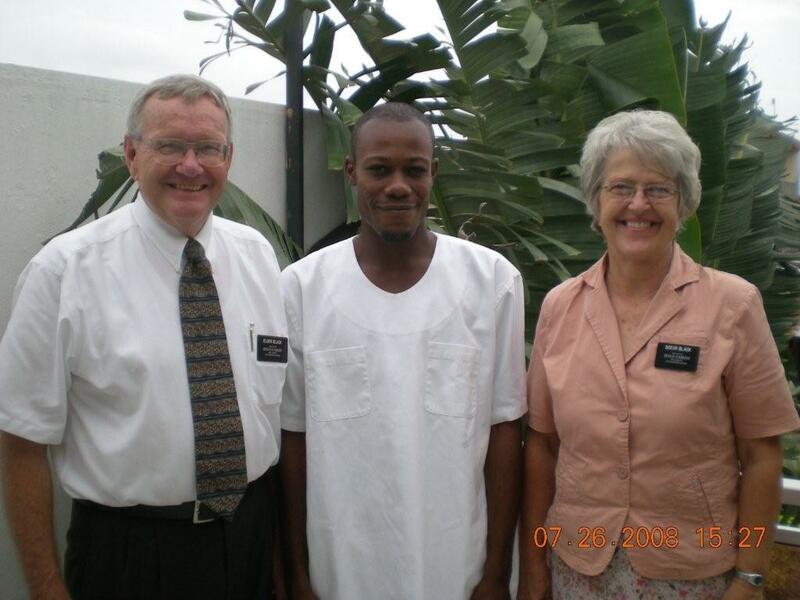 Godwin is one of our branch members who is waiting for his mission call which could be coming any time now. He lives here in Cotonou by himself. His father lives in Togo and his mother lives somewhere out in a village but he doesn’t seem to have much to do with his mother. I think it has to do with something about the step father she married. Being alone he seems to show up once in a while about meal time and seems to enjoy Soeur Black’s cooking. We are happy to have him come because he never takes advantage and always wants to do the dishes or help in any way he can. He just seems really grateful for any help we offer. I am sure a few times he has come, he hasn’t eaten for a day or perhaps more. He has taught himself English and likes to practice that when he can but he is always soft spoken and never obnoxious. He quietly goes about doing whatever he can in the Branch and is going to make a terrific missionary. I suppose the big news this week is the visit of President Ayekoue along with his wife and daughter. 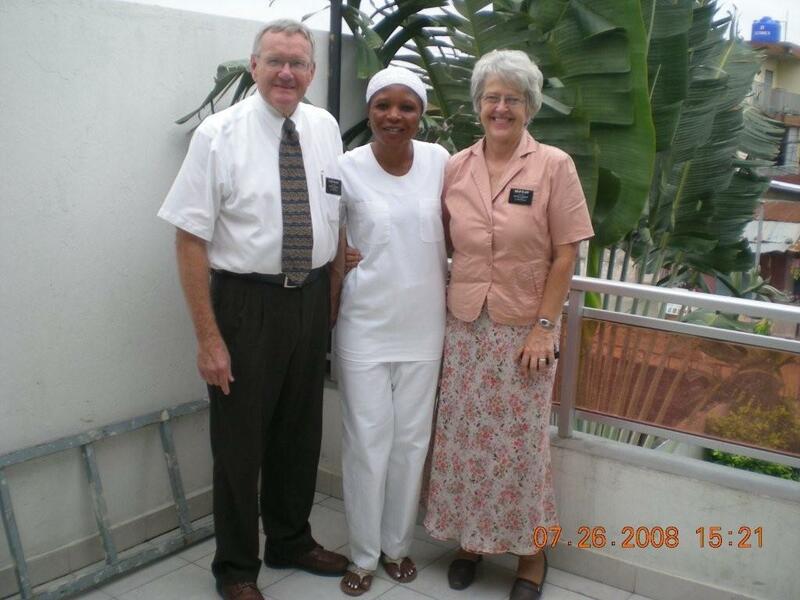 We picked them up at the airport on Thursday afternoon and got them checked into a Hotel then had interviews here at our apartment that evening until late with Sister Black and me, Elder Crooks (our district leader), and Elder Kabangu who is being released. After that we had a nice dinner before taking them back to the hotel. President Ayekoue can get by in English but speaks French whenever possible. 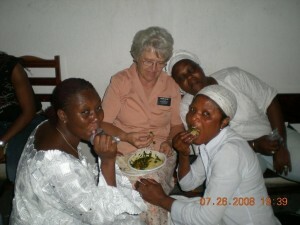 Sister Ayekoue is just learning English so she and Soeur Black practiced on each other. The big news, and you will note that most of the pictures for the week are about Happy Ayekoue. She is the 2 month old daughter and is just a doll. She wins everyone heart. 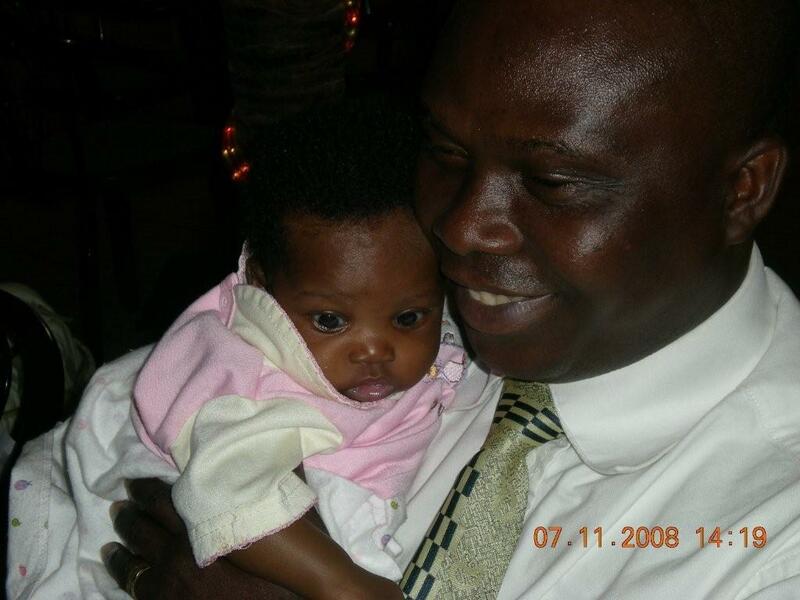 President and Sister Ayekoue have a 9 year old boy and then have not been able to have any other children until this little girl was born 2 months ago. When she was 5 weeks old they took her to Provo to the Mission Presidents’ seminar for 10 days. I guess they almost got her taken away there with all of the older mission presidents and their wives. President Ayekoue has a huge job ahead with very little help. They have not had any white elders in Ivory Coast since they had a revolution there a couple of years ago. Also the only mission couples are us here in Benin and the Gillis’ in Togo–none at all in the mission office, so he is trying to get by with just two elders in the office and one sister who helps with office work. Add to that a two month old baby and you get the idea of the size of job he is facing. A few weeks ago I wrote a proposal that we needed to divide the branch here and spread out our missionary efforts in the City. The chapel here is crowded to capacity every Sunday and everyone, missionaries and members, are pretty much stacked on top of each other. I have kept it a little quiet so as not to cause a stir in the Branch. When we had our interview with the President, he said that he and President Dil had talked about it and both thought it was the way to go, so he gave us the go-ahead to locate missionaries into Akpakpa and get a branch started there. On Saturday, we had a meeting with all of the Branch leadership. He gave some really good training talking about keeping the commandments and helping the church to grow. Then he drew a map and said the plan was ready to make two more branches in the City. I guess the cat is out of the bag now and we have our work cut out getting missionaries re-established and two new branches formed. It is pretty exciting and a much-needed step, but will be a lot of work by the time we find facilities, define boundaries and call new leadership. Other new assignments are that Soeur Black is to inspect the elders’ apartments on a regular basis and give instructions as needed, and we are to establish a mini distribution center here at our apartment. That will help a lot also because getting even basic materials here like Bibles and triple combinations seems to be a problem. 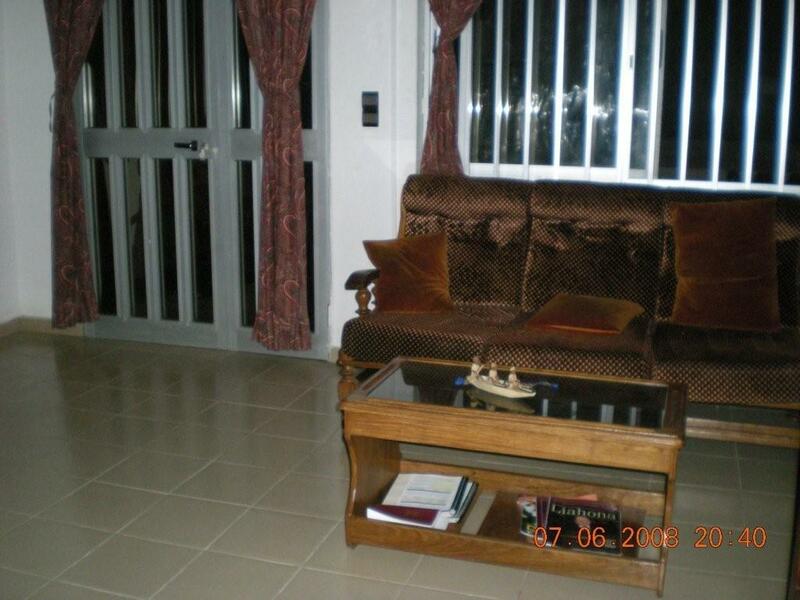 President Ayekoue isn’t one to overlook details either. Other jobs are to change the curtains in the Branch President office from the flower prints to white and to make sure there is toilet paper in the bathrooms and see that the chalkboards are erased when class is over. The toilet paper has been a problem because the members sometimes take it home so someone is assigned to gather it up and put it away after church. No more. President Ayekoue says if that is a problem then teach the branch members not to take the toilet paper home. 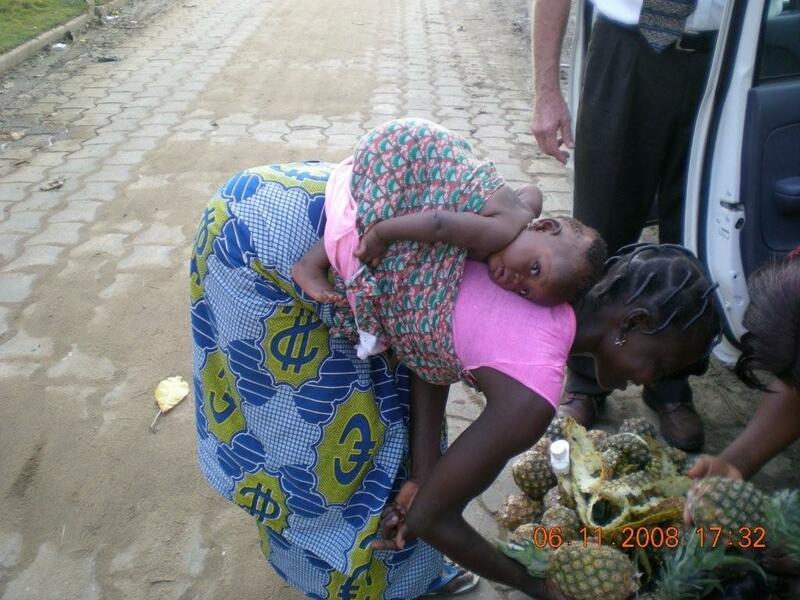 It is just amazing the things you get into when you serve a mission in Africa. We wouldn’t trade it for anything. West Africa is really on a winning streak! Yes, West Africa is winning again and again. We told you of our diesel shortage last week and how it forced us to park the pick-up and do a little more walking. But that was OK as we never went without anything. This week our electrical situation is the news. It has been real discouraging. One day we had power for an hour or two in an 18 hour time frame and then the next day it was not too great either or the day before. We do have a generator but it kept blowing a fuse so at night it was sweltering. I know why it is a survival society as you do anything to make life just a little more comfortable. In fact, I turned around in the bed and put my head at the foot just to catch a little breeze. When there is no electricity it affects the water so we have had a water shortage. We also tried to fill the gas tanks for the stoves and guess what? No gas to be found in our neighborhood. I guess I was crying a little of my own but after thinking about the situation, I have decided that we still have it much easier than 99 per cent of the people who live here. We have a Toyota pick-up with a great air conditioner, a nice apartment with three bedrooms and bathrooms, a laundry, drying room, a kitchen with an apartment sized stove with an oven, a large frost-free freezer, an air conditioner in the living room and our bedroom and the Internet. So why am I crying anyway? I have to remind myself about how my perspective of gratitude has changed since arriving here in Cotonou. We are truly blessed! The things I just described are simply minor inconveniences. When we came home last night, there was water running out of the garage into the sandy street. That was definitely not a good sign and Pete knew immediately that the pump in the garage had problems. Today he decided to fix it himself as the last plumber that was called charged about $90.00 for a little job. He found the parts he needs but also needs a hacksaw to cut the PVC pipe. He and Elder Kabangu are trying to find one now but he odds are against them when you have no idea where to go. Well, he is back without a saw but thought he had it fixed anyway, but not so. Without the pump, we get low on water and can’t even shower. I guess the next way is to shower like any other good African. You simply stand in a very, very large bowl and pour water over the top of you, lather up a little and pour more water over you. At least that is the way the kids bathe so I assume that is the way the adults bathe also. I have seen some huge aluminum bowls that even we grand people could stand in. Right now I would welcome cool water as the electricity is out again. I really admire the Africans here in Cotonou as most are clean and impeccable and come out of such humble homes with no running water and sometimes no electricity at all. It seems like more and more of our time is being taken up doing administrative kinds of things. Between mail, reports, bills, Church magazines being delivered in the wrong language, vehicle requirements, medical tests for the elders and various members, making repairs at the chapel and at our apartment, and a number of other things there is not a lot of time left. We did manage to get a little missionary work done this week in spite of it all. 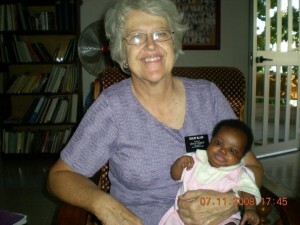 We took Nadia, one of the branch missionaries who speaks Fon and went to Calavie to teach Carole’s mother again. That is always a delightful experience. While we were there, Nadia also took us to visit her Aunt and Grandma who live not too far away from Carol’s Mom. They treated us very well and would love to have the missionaries come but when they live that far out, they need to come to church before we could do much. They have promised to come but haven’t made it yet. We also paid a visit to Jemimah and Liza’s house. 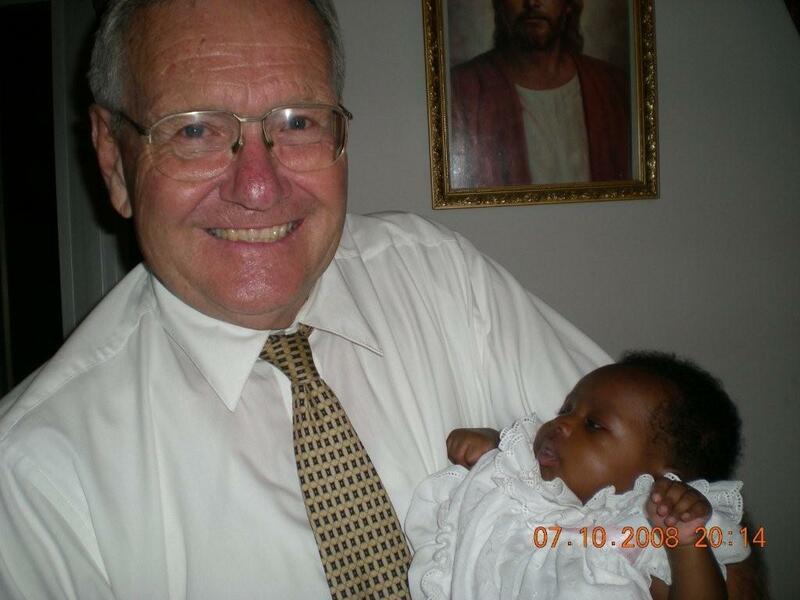 When the Elders wrote down her information for her baptismal certificate, they discovered that she had two children and the first was born when Jemimah was 9 year old. That didn’t sound right so we went through things again and discovered her birthday was off by 10 years. She is about 28 now and has two boys she had to leave behind in Liberia. Her husband was killed in a bombing of the US Embassy there where he had taken refuge during the war there in about 2006. Don’t know all of the details but it is kind of sad. 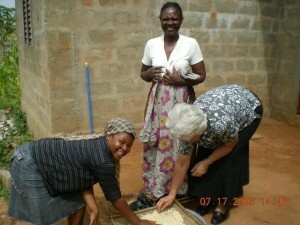 Jemimah seems to take it all in stride and is upbeat and always at church with a smile on her face in spite of everything. I guess that is just the way things are in a subsistence society. Kind of makes you realize that not having electricity when you need it to keep cool probably isn’t the greatest tragedy in life after all. The 4th of July came and went without fanfare. Just another hot day in Cotonou. Sorry we missed the big reunion. Thanks to Ramon’s family for sponsoring it. Wish we could have been there. We had heard that the American Embassy here invites all Americans to a picnic with hamburgers and hot dogs but if it was so we didn’t get the word and half of our Elders don’t fit the American category anyway so we didn’t really pursue it. Maybe next year. On Saturday, we received a call from our new mission President. He is coming over on Thursday and will bring his wife and little baby. We will be having a zone conference with all the missionaries here as well as interviews and meetings with the Branch Presidency. After he gave me the schedule he asked to talk to Soeur Black. She was pretty worried but apparently his English is better than her French so they got along okay for a short conversation. More on our new President after we get to work with him some this week.